In other words, Google will be more responsive to corrective actions taken by site owners who were engaging in bad link building practices. Penguin operates in real-time now. This means that your site’s rankings may change each time Google updates the information about the particular web page and other pages linking to it. The real-time algorithm helps you recover faster from a Google penalty. If your site is penalized and you do a good job removing “unnatural links” from your website, you’ll see positive results for your site in SERPs as soon as Google recrawls the page. Penguin is a part of Google’s core algorithm. Google released an official statement stating that Penguin 4.0 is now a part of Google’s core algorithm. Penguin is now more granular. Penguin now devalues spam by “adjusting ranking based on spam signals, rather than affecting ranking of the whole site.” This essentially means that Penguin will now focus on specific pages that the toxic links are pointing to, and not the whole website. This will also make it more difficult to track the Google penalties. Penguin 4.0 was released for all countries and languages at the same time. This means that all websites will experience the same impact irrespective of their location or language. This is the last Penguin update. Penguin 4.0 is the last Penguin update in history. There will be no other update. 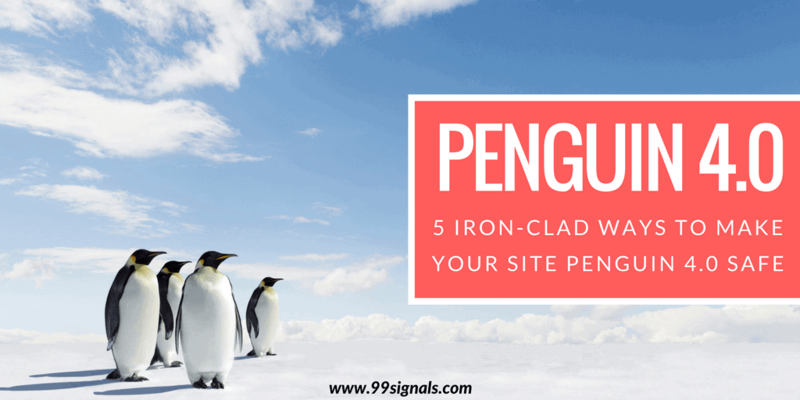 Now that you know the implications of Penguin 4.0 for your website, let’s look at some of the best ways you can make sure your site is Penguin 4.0 safe. One reason why Penguin 4.0 is so scary is because you’ll never know whether your site is being penalized by Google. Having said that, there are certain steps you can follow to make sure you don’t falter in the eyes of Google. 1) Keep Your Backlink Profile Clean and Disavow Toxic Links – Penguin 4.0’s main job is to detect toxic or unnatural links. As such, marketers need to take a closer look at their backlink profile and take any steps necessary to disavow their sites from toxic links. 2) Constantly monitor your positions in SERPs – Use a tool like Ahrefs or SEMrush to keep a track of your site’s position changes in SERPs for your focus keywords. Both these tools allow you to set up email alerts to help you stay informed of any position changes. 3) Update Your Disavow File – Set up properties in Google Search Console not just for the main domain, but also for important subpaths or subdomains and update your disavow file as needed. You can also use SEMrush Backlink Audit tool to easily format disavow files. 4) Work on Your Internal Links – Penguin is not just about external links pointing to your website, it’s also about internal links. So make sure the internal links on your website are relevant and that not all of them are exact-match keywords. 5) Follow White Hat SEO Techniques – Penguin 4.0 is yet another step taken by Google to thwart black hat link building techniques. So it’s important that you steer clear of black hat tactics such as buying links and engaging in reciprocal link exchange activities. Just focus on creating awesome content and follow white hat SEO techniques. So what do you think of Penguin 4.0? Have you noticed any position changes for your site since the roll out? Let us know in the comments section.